This compact strobe light is an old classic disco effect that produces bright bursts of pure white light in fast succession. This model is set at 10 flashes per second constant speed. It is an Ideal addition to your Office party and home disco lighting as it runs on batteries so can be used anywhere. Can be used on it's own or placed around the area in multiples for a more three dimensional effect. Comes with angle stand/mounting bracket and uses 4 bright white LED bulbs, Approx. size 13-cm x 9-cm x 5-cm black plastic finish with clear perspex front bulb cover. Great for Halloween horror house setups and funky parties all year round. 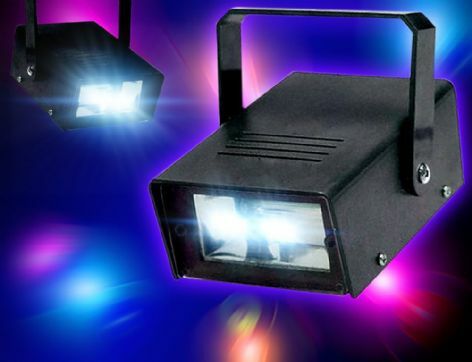 little sparkle in brighter rooms, it is not a a full powered blinding disco strobe light.